speaking about her actions with the Australian Youth Climate Coalition at the Community Conversation. 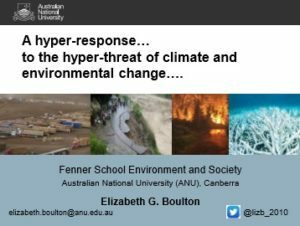 a presentation of her study of a Hyper-response to the hyper-threat of climate & environmental change. I am really happy starting off a discussion here in my hometown, an incredible space of creative and sustainability-oriented activism with a culture not only of resistance to McDonalds and pokies, but also of defending our natural and built heritage in our landscape. We are building a regenerative culture as our experiences of struggle, defeat and success are passed on through generations who need to keep fighting for social and environmental justice. 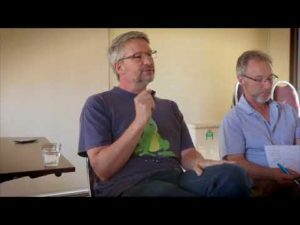 These conversations and many much more informal aspects of our everyday life in the Castlemaine region are part of that process. Today, we face massive environmental and economic challenges, so big, that they call on us to not only to imagine, but also to create, a new kind of world. That new world would need to be much more environmentally sustainable and socially fair and just. I think it will be us at the grassroots who will make these changes; I think that governments and markets are incapable of that task at hand. That doesn’t mean I would give up on asking and partnering with government and even businesses to achieve certain goals and projects. But I certainly wouldn’t necessarily expect them to ‘dance with us’ or to dance to our tune. So, if we are to achieve change, we need to engage in direct action, demanding and achieving the creation of safe and impressive spaces that are all ours, where we nurture collective governance and shared self-management. This discussion paper relates to the event ‘Could a ‘Standing Citizen Chamber’ restore trust, confidence and resilience within local communities?’ held in Castlemaine on July 24th 2018. Relevant links can be found at the end of the paper. Event Overview: In July 2018, 16 central Victorians came together to discuss the opportunity presented by changes to the Local Government Act as well ‘Standing Citizen’s Chambers’ as one model of deliberative decision making. The conversation was led by Cathy Wheel, who spoke to the opportunity that deliberative democracy offers for trust and resilience, Geoff Turner, who spoke to the changes to the Local Council Act, and Lexi Randall- L’Estrange, Democracy for Dinner Convenor, facilitated the conversation. The February 2018 conversation was with economist Warwick Smith. The Political Economy of Housing.